Set on the remote and rugged Isle of Skye, a place of unique beauty, peace and tranquility, Trotternish Ridge View self catering accommodation, is an immaculately presented, extremely bright and spacious, fully fitted, modern detached bungalow, enjoying wonderful open views across the countryside towards the spectacular Trotternish Ridge. Trotternish Ridge is located at the north east end of the island which boasts splendid rock formations such as the `Old Man of Storr', the beautiful Quiraing and the impressive Kilt Rock. Museums, castles and sites of historical interest, as well as nature trails and gardens are some of the many attractions of the Island. The area is also popular with walkers and climbers. 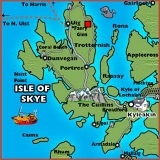 Looking for some adventure whilst on Skye? Check out Skye Adventure for a great range of activities from guided walks, to scrambling, climbing and activities suitable for all the family. For anglers, the island offers trout fishing opportunities throughout its fifty mile length with the best of the trout fishing on the Storr Lochs, Leathan and Fada. The Kilmartin River, with runs of sea trout and occasional salmon, flows by the cottage (approx. 300m away). 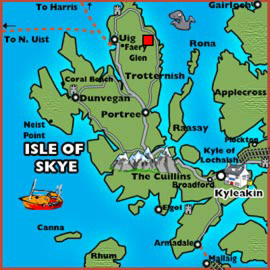 Portree, the island capital, is only 13 miles away. A shop and restaurant are located 2 miles away, with the 'local' pub a mere 4 miles away!